Mr Lawoetey Tettey, the Director of Human Resource at the Ministry of Food and Agriculture, has called on Agriculture students to venture into the sector, as it remains a very lucrative option. Mr Tettey said for many years, the food and agriculture industry has offered numerous opportunities to industry players and that it is time for the younger generation to take advantage of the many benefits. He was speaking at the maiden edition of the Agricultural Students (AG-Stud) Career Guidance and Mentorship Dialogue Boot Camp designed to lead the cause for youth agriculture reawakening organised by 'Agrihouse Foundation'. He said the help of all stakeholders are needed to help change existing perceptions to draw the youth into the sector. Mr Tettey said Agriculture was not only about tilling the soil but there were many other areas in the value-chain. He said the youth could venture into other activities in the Agriculture value-chain such as fishing, poultry farming, food and fruit processing, and many others. He said government over the years has changed the policy on agriculture to make the industry more attractive to the youth adding that the state has five agriculture-training institutes to provide short and long-term training in the Agriculture sector. Ms Alberta Nana Akyaa Akosa, the Team Lead of the Agrihouse Foundation, said the AG-Stud had come to guide, shape the agribusiness conversation, change business perceptions, and possibly transform lives of students in Agriculture. She said the foundation also seeks to introduce students to the numerous opportunities in the vibrant world of business-Agriculture. In a speech delivered on his behalf, Mr Laudemar Aquiar, the Brazilian Ambassador to Ghana said the dialogue is a symbol of Ghana's commitment to the agricultural sector and an appreciation of the men and women who work hard to produce the food we eat in this country. He commended President Nana Addo Dankwa Akufo-Addo for his vision in identifying agriculture as factor for prosperity and for launching development programmes such as Planting for Food and Jobs as well as the One District One Factory policy. 'With vast expanses of productive lands, an interested and dedicated citizenry and with government and private sector support, Ghana is poised to develop its full potential and carve for itself a remarkable position in Western Africa's agricultural industry', he said. 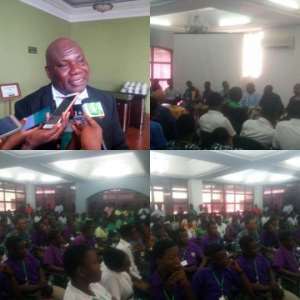 Mr John Adomako Asabere, the Deputy Chief of Party at 'Amplifies Ghana' of the United States Department of Agriculture, urged students to take hold of the numerous opportunities in the Agriculture sector. He said the sector is now highlighting the importance of egg consumption and this necessitated the launch of the 'National Egg Campaign' to promote the growth of the industry.